You never thought Star Wars would relate to psychology and personality types, did you? 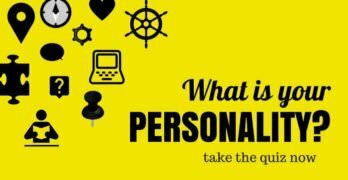 Check out this infographic from Geeks in Heels to find out which character you are based on your MBTI personality type. The MBTI (Myers–Briggs Type Indicator) is an assessment designed to determine how people look at the world and make decisions. 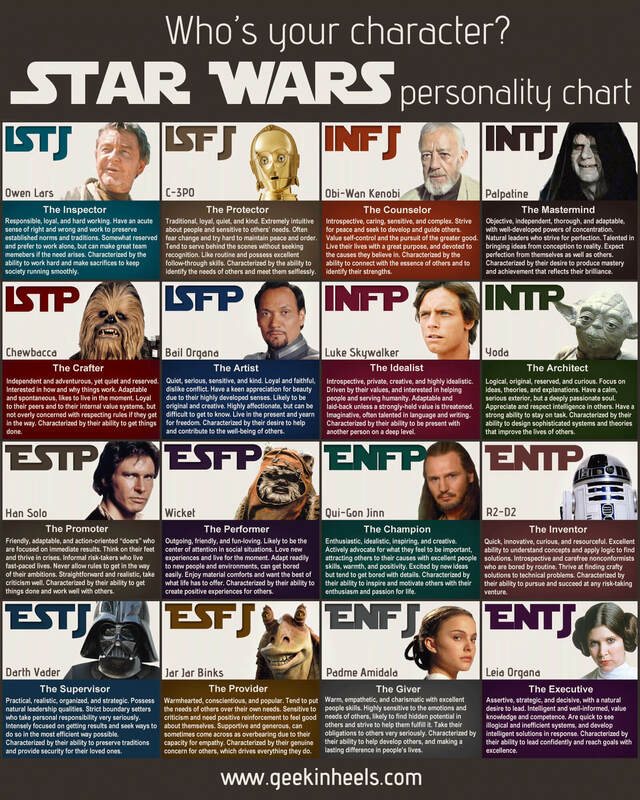 In this chart from Geek in Heels, 16 characters from Star Wars are given their own MBTI type profiles. 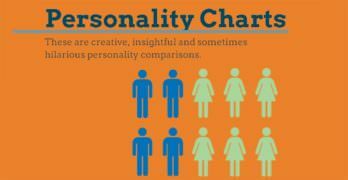 Find out your personality type and then compare to the chart! Comical and entertaining, the chart also stays pretty true to the characters in the movie. The personality types are pretty spot on; let’s go over a couple of the big names. The INFJ personality type is by far the most rare of all types, making up only 1% of the population. Standing for Introverted Intuitive Feeling Judging, INFJs are calm, gentle, incredibly complex, and highly intuitive individuals. Characterized by creativity and resourcefulness, this type portrays Obi-Wan perfectly as the counselor and protector. The Introverted Intuitive Feeling Perceiving type embodies all that Luke Skywalker is made out to be in the Star Wars films. Like the young Jedi, most INFPs do not like conflict, but they do rise to it when necessary. Their approach is through their feelings, generally based upon the idea of right or wrong. Flexible and laidback, just like young Skywalker before he discovered the truth, INFPs are calm until their values are threatened; then, they become aggressively defensive. What is your Rebel cause? Like other ESTJs, Darth Vader places all emphasis on a world of fact and concrete needs. After the loss of Padme, Vader’s vision was set, a standout characteristic of the Extraverted Sensing Thinking Judging personality type. Extremely rigid and often neglecting of their Feeling side, ESTJs, like Vader, are isolated and aggressive. ESTJs must remember to sometimes turn to their feelings, just as Vader did in order to save his son’s life. So which Star Wars character are you? In addition to those listed above, this chart provides a character reference for each of the 16 MBTI personality types, taken from across the span of all six Star Wars movies. They may be from a long time ago in a galaxy far far away, but they’re just like you! What Stresses Each Personality Type? Just took the MBTI personality type test and got an INTP i.e., The Architect. Was absolutely dumbstruck when I found out that it’s Yoda for me. Dumbstruck because, believe you me, Yoda has always been my favorite Star Wars character. This MBTI thing is frigging magical. How’s that even possible? Han Solo is an ENTP maybe INTP not an ESTP. He always uses his gut to do thinks. Like in the new movie shen he tells Rey that he doesn’t ask if what he does will work until afterwards. People who use senses rely on facts and rules, which is the opposite of Han. Although his name is Solo, he appears extroverted to me. He has deep personal relationships throughout the outer rim. You may be right about the intuition. Palpatine has always been my favourite Star Wars character and some people cannot understand why I love someone so “evil”. This perhaps explains why I’m so drawn to him, because he has the same personality type as me! When I was a kid I always liked Luke Skywalker. I never understood why most my friends liked Han Solo better, I saw him as a self serving jerk but did realize he would end up doing the right thing. Turns out when I took Myers Briggs personality test I am INFP like Luke Skywalker.